We acknowledge the Wurundjeri People of the Kulin Nation are the Traditional Owners of the land on which our music is written and produced. We acknowledge sovereignty has never been ceded. We pay our respects to Elders past, present, and future. We wrote and recorded this song in that strange and small bridge of time between the end of one year, and the start of another. The train of 2018 has gone. 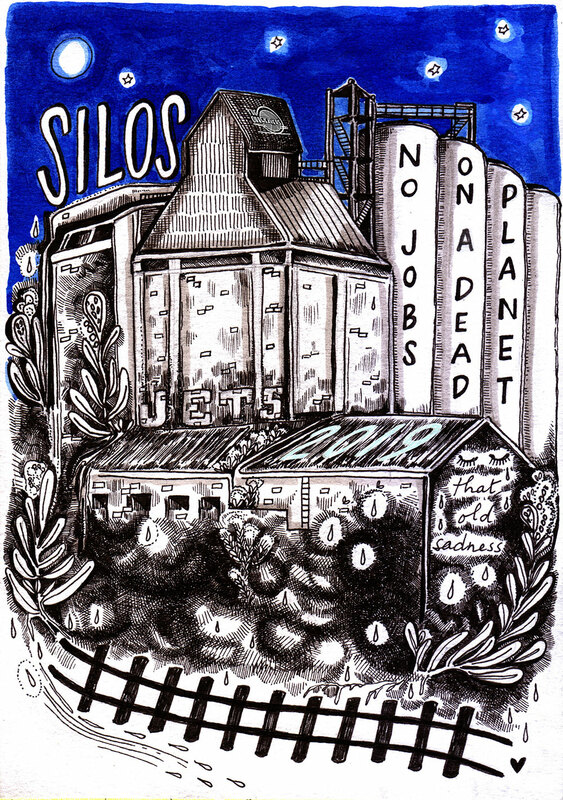 Past the silos, where all that old sadness seeped into the ground. Can still feel it every time the train rolls by. Water flows out into the bay, as it always has. We cross over the bridges, over rivers and creeks, on Church Street, on Punt Road, on Arden Street, on Dynon Road, and there are those silos again, in Brunswick, Collingwood, Richmond, Kensington, standing on the horizon. (All our dreams and lies). And now my feelings remain. My whole life rolls by. Newer Volcanics is a creative project with accompanying performance by The Orbweavers responding to the volcanic plains and waterways of western Melbourne. The performance will be premiered at The Substation arts centre in Newport on 29 & 30 November 2018, and is presented in collaboration with The Letter String Quartet and filmmaker Brian Cohen. Newer Volcanics reflects on geology, industrial history and environmental change through song, spoken word and visuals. A limbic interpretation of landscape, Newer Volcanics is created from psychogeography and research we have undertaken as Creative Fellows at State Library of Victoria. Newer Volcanics is a geological province in south-east Australia. It includes the country south west of Narrm (Melbourne), the unceded sovereign lands of the Wathaurong, Wurundjeri and Boon Wurrung people of the Kulin Nation. A landscape characterised by water courses carved through ancient volcanic plains, silty clays, estuarine sediments, and low lying tidal salt marshes of abundant birdlife, where creeks and rivers meet the sea. Much of the land in the inner-west has been has been paved and overlaid by post-settlement industry and transport infrastructure, but the waterways and sometimes their immediate surrounds persist, a living thread of the past and the present, a continuing flow and force through time. Psychogeography describes how we currently think about place in relation to our creative work: drifting through urban areas, letting our minds wander over layers of history visible as accretions and remnants; contemplating personal connections and reactions to the landscape. Over the last year, we have been walking the lava ridges and soft lowlands of western Melbourne any weekend we can. We have walked from Moonee Ponds Creek to the confluence of the Maribyrnong and Birrarung (Yarra) Rivers. Past Stony and Kororoit Creeks, and south west to Skeleton Waterholes Creek. Where waterways have been forced through tunnels and industrial tracts, we jump fences, skirting tracts of colonising onion grass and Morning Glory along railway embankments, under freeways and along wire fencing, to arrive in fennel-covered edgelands of unknown jurisdiction. Psychogeography is like being a kid again, wandering beautiful, and sometimes desolate places without clear intention. Walking through Melbourne watercourses has brought us to psychogeography, to histories and peoples, to environments and industries, and to creative spaces where we try to acknowledge the weave all these elements make. We want to acknowledge that we are writing on land where sovereignty was never ceded, and pay attention to stories of pain as well as resistance, histories of peoples, cultures, lands and waters. In creating these works we hope to draw attention to different parts of Narrm - Melbourne, and particularly to the layers that make all of us here. Melbourne band The Orbweavers unveil their haunting new single Radium Girls, with a video by Berlin-based Australian artist, animator and award-winning music-video director Lucy Dyson. 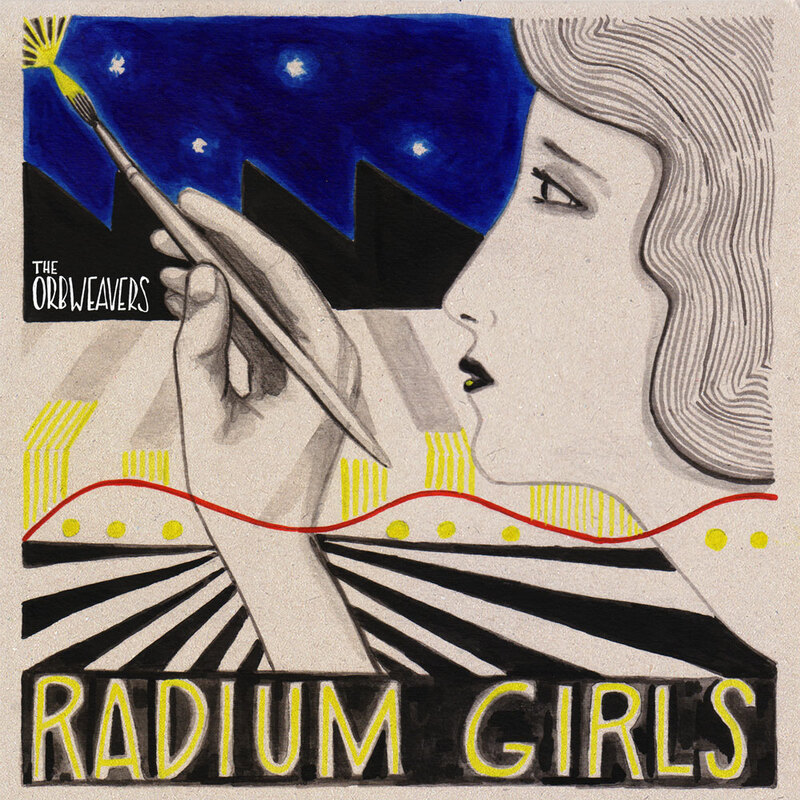 The song and accompanying video tell the story of a group of women factory workers known as the ‘Radium Girls’, who were employed to paint luminous dials in the 1910s - 20s . Radium, number 88 in the periodic table of the elements, is radioactive, toxic, and was historically used to paint luminous dials for watches, clocks and aircraft instrument panels. Radium dial painters were encouraged to lick their paint brushes to keep a fine point, without realising they were ingesting toxic amounts of radium. In the body, radium mimics calcium, and is absorbed by bone marrow. Over time the dial companies became aware of the health hazards of radium based paint, but continued to use it without providing adequate occupational safety controls. Workers became seriously ill as a result of their exposure, took their employers to court, and eventually won - but not after gruelling court trials where their illnesses were doubted by their employers. International health and safety regulations for occupational exposure to radioactive materials developed as a result of the ‘Radium Girls’ case. The use of radium paint for luminous dials was eventually banned, but not before many workers died of exposure related illness. Subjects: poisons, mining, industrial history, occupational health & safety, clockwork. Geologically, deep leads are buried ancient river beds which sometimes contain alluvial gold. In Victoria, they usually lie beneath basalt lava flows which hold younger waterways on the surface above. Deep lead gold mining required cutting deep, dangerous shafts through hardened volcanic rock. The shafts were at risk of cave ins and flooding from aquifers, and often did not contain the gold hoped for. To use this geology as a metaphor, ‘Deep Leads’ is the underlying layer to our previous album ‘Loom’. Where Loom explored the basalt bed and surrounds of the younger Merri Creek waterway, Deep Leads heads underground and within, exploring industrial, agricultural and personal histories (Blue Lake, The Dry, A Very Long Time) , heavy and precious metals (Radium Girls, Mine), internal realms of escape and quest (Poison Garden, Cyclamen, Nitrates). 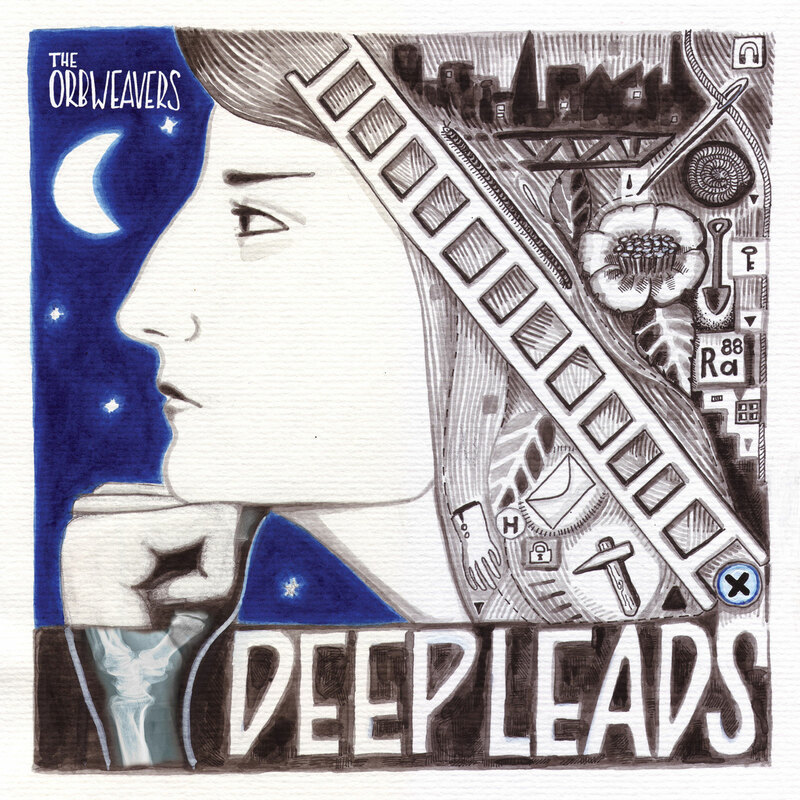 We recorded and produced ‘Deep Leads’ at home in the Merri Creek water catchment area. There are many accretions of history along this waterway, and it always seems to find a way into our work and life. The street we live in is a stormwater course to the Merri. The album was mixed by the banks of the Merri in East Brunswick by James Cecil at Super Melody World, and mastered just uphill to the west, on Brunswick high ground, by Adam Dempsey at Deluxe Mastering Melbourne. An evening invocation for protection through winter, and deep sleep. Cyclamen are associated with the Ancient Greek goddess Hecate, who is often depicted holding torches. Hecate in turn, is associated with knowledge of poisonous and medicinal plants, a mediator between mortal and divine realms, a goddess of the crossroads. Cyclamen is the second single from Deep Leads and the second song of 10 tracks. Sophie, Ash and Wayne. Thank you James, Adam, Paddy, Dan A., Stuart, Jen and Dan N., Bek, Sean, Grant, Lucy, Glen. Thank you Flanagans & Dysons. Thank you friends. Thank you listeners. Thank you Fern.